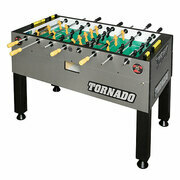 At The Shuffleboard Federation, we have different models of the superior quality tornado foosball table for sale. Whether you�re an leisure player or a competing professional, these foosball tables will give an edge to your game and provide family and friends of all ages with many years of fun. The Tornado Tournament 3000 offers the same features as their coin-operated Platinum Tour Edition. This includes patented players that are redesigned for better control and passing, and a high grip interchangeable handle system. The mach and game counters are officially sanctioned by the International Table Soccer Federation. The Tornado Elite Foosball Table is designed for ruggedness and improved play, with heavy gauge rods, solid corner construction and a patented bearing design. The tables have a cherry wood laminate cabinet finish and solid wood handles. The Classic table has a modern look with leather laminate finish, matched with heavy duty construction. Its high-performance parts are featured on Tornado�s higher end commercial tables. The Tournament 3000, Elite and Classic models have adjustable commercial-grade leg levelers. The Sport model boasts the same quality construction, with Mahogany Melamine finish on the 1-inch thick cabinet. All models have a 3/4 inch playfield. All our Tornado tables are built to last for gaming enjoyment for many years to come.